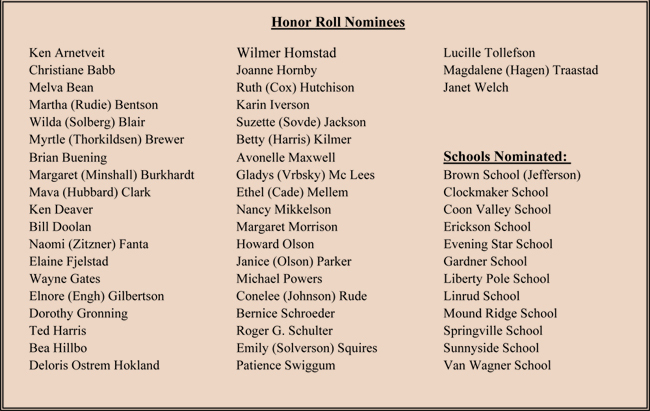 Honor a Vernon County Teacher or School that has made a difference in your life! 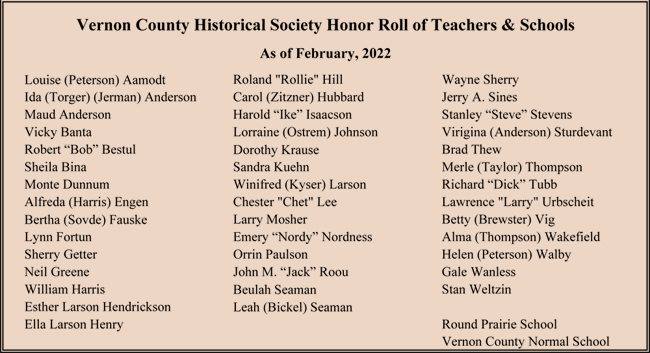 The VCHS has established an Honor Roll to recognize and remember individual teachers, living or deceased, as well as all Vernon County schools including country schools, the Normal School, and those schools serving students today. Begin by making a contribution of $25 or more. When additional contributions for that teacher or school reach a total of $500, the name will be added to a public display in the museum. Your donation will not only honor a special teacher or school but will be placed into a fund for the upkeep of the Normal School Museum building. Previous donations made by you contributed to the Capital Campaign/Elevator fund. The elevator was dedicated on October 29, 2017. 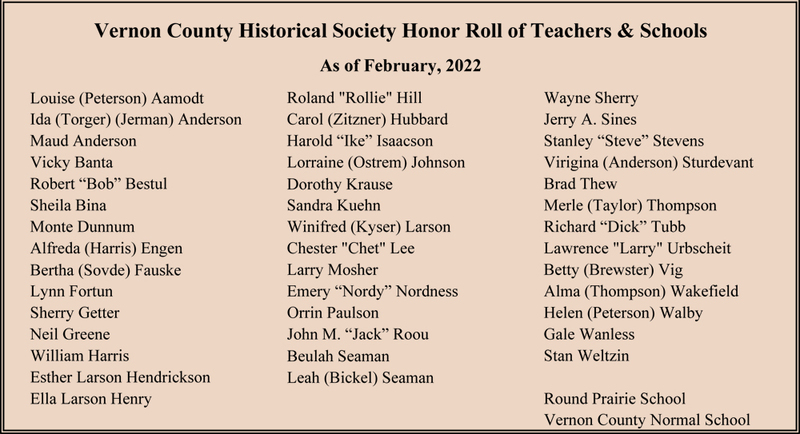 To recognize a favorite teacher or school, nominations and donations may be mailed to the historical society: P.O. Box 444, Viroqua, WI 54665. More information is available at the Vernon County Museum, 608-637-7398. 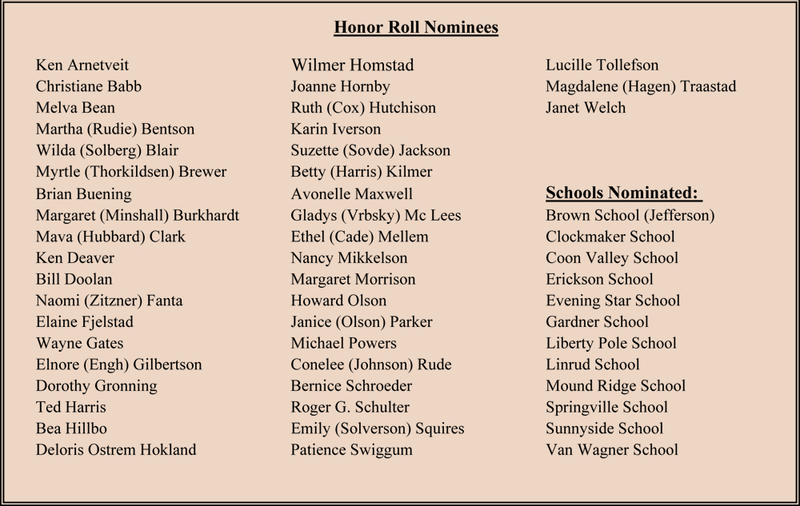 The teachers and schools nominated below still need additional contributions of $25.00 or more to add up to $500.00 before adding them to the honor roll.